I hate to discourage you, but as I have said hundreds of times over the last ten years, small batteries are not going to cut it if you expect to see anything. I am trying to be as honest as I can. The difference between success and failure with this system is NOT huge, and you need every bit of help you can get. 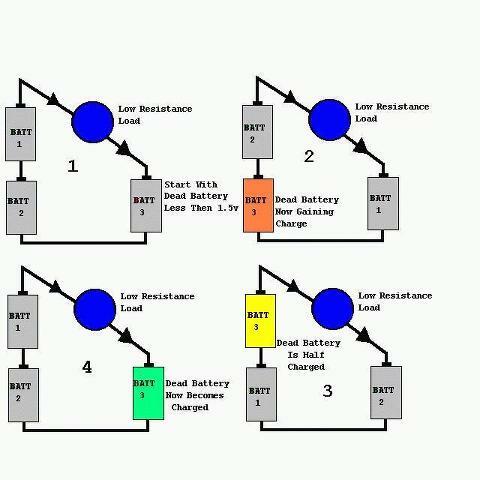 The conductance, internal resistance and impedance of a battery are linearly correlated to each other across a wide range of battery capacities, and are basically a measure of the same thing. The smaller the battery, the more "resistant" it is to charging, which basically means there are two separate and distinct "costs" to charging a battery. The first is the amount of energy you actually put into the battery. The second is what you pay to "be allowed" to put that energy into the battery in the first place. Think of it as a "tax" you pay to charge a battery. The bigger the battery, the smaller the tax. The smaller the battery, the larger the tax. So when you are trying to recycle energy or conserve energy with a very small prototype system like you are building, that tax is going to KILL your results. Large systems with large deep cycle batteries. Voltage 2.5 volts higher than the standing voltage of the battery. I asked Bob French to post and show how he was currently using a small solar panel to take advantage of the 3 Battery system, because I know how much testing of this system Bob has done, and he and I talk all the time. ANOTHER way to gain an advantage using the 3 battery type setup with solar is to run your inverter between the output of the solar panel's charge controller and the batteries you are trying to charge. Put ALL the batteries from your whole system in parallel which means you maintain the potential difference for the longest time possible. Then when all the batteries are charged, run the inverter directly off them. You have used the energy TWICE. You have basically doubled the time your system can run on the batteries you have. If the output voltage of your particular charge controller is not high enough to allow you to do that, well that's what a boost module is for. I am in total agreement with you about the larger battery's. The effect is impossible to miss on the larger battery's. I have noticed this on small 1.5v Dcells as well. I have seen this work with the 7AH battery's and while I agree its not going to blow your mind with the results, it works and I am going to log it this time.